CCR has a strong practice of engaging with international human rights bodies to bring attention to our issues and uplift the experiences of those most impacted by the U.S. government’s failures to protect and uphold human rights. Independent human rights experts regularly review whether governments are in compliance with their human rights obligations. CCR engages with these experts by drafting shadow reports and other advocacy materials, providing testimony, lobbying, and working in coalition with our partners to use these opportunities to highlight serious human rights violations. CCR has played a critical role during periodic reviews of the U.S. government by UN treaty bodies, including those that review the U.S.’ compliance with the International Covenant on Civil and Political Rights (ICCPR), the Convention against Torture and Other Cruel, Inhuman or Degrading Treatment or Punishment (CAT), the Convention on the Elimination of all Forms of Racism (CERD), and during the cumulative Universal Periodic Review (UPR). Additionally, CCR advocates before the Inter-American Commission on Human Rights (the regional rights body for the western hemisphere). CCR submitted written testimony to the United Nations Committee Against Torture (CAT) in March 2016 as part of follow up from a formal review process, which took place in November 2014 in Geneva, Switzerland. In advance of that formal review process, NGOs and directly impacted individuals and survivors testified before the Committee, the U.S. delegation, and UN staffers and the public. For the first time in its history, the committee heard directly from one of the men tortured at Guantánamo, CCR client Murat Kurnaz, who delivered testimony. Murat was joined in Geneva by his lawyer, CCR Legal Director Baher Azmy, who delivered a powerful statement to the U.S. delegation about the ongoing torture at Guantanamo and the U.S. failure to close the prison. 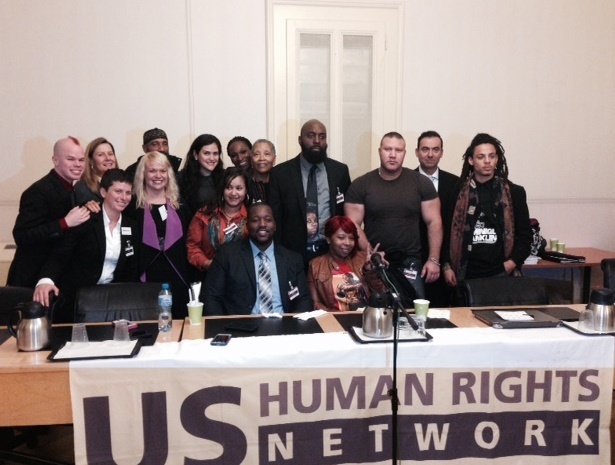 Murat also spoke at an event co-sponsored by CCR and the US Human Rights Network, Building a U.S. Movement to End Torture, that featured the parents of Mike Brown, the 18-year old killed by police in Ferguson, MO, and others, speaking to a wide range of CAT violations. During the session, the Committee raised a range of issues including: extraterritorial application of the Convention; CIA’s secret detention, extraordinary rendition and interrogation program, Guantanamo, investigation and prosecution of those responsible for torture; immigration enforcement abuses; death penalty; police brutality; prolonged solitary confinement; protection of prisoners against violence; clergy sexual violence; sexual violence in US military; and the use of conversion therapy on LGBTI individuals. In 2014, CCR joined dozens of other civil society groups in submitting shadow reports to highlight issues of concern and the failures of the U.S. to comply with its treaty obligations under CAT. Following the review, the Committee issued a series of concluding observations and recommendations, and the U.S. government submitted its one-year follow-up report in 2015. The U.S. previously reviewed by the Committee in 2006, after which the Committee issued its concluding observations. In advance of the upcoming review of the U.S., in 2010 the Committee issued a list of issues to be addressed, and the U.S. submitted its response in 2013.